Published with a new afterword from the author—the classic, bestselling account of how the modern Middle East was createdThe Middle East has long been a region of rival religions, ideologies, nationalisms, and ambitions. All of these conflicts—including the hostilities between Arabs and Israelis, and the violent challenges posed by Iraq’s competing sects—are rooted in the region’s political inheritance: the arrangements, unities, and divisions imposed by the Allies after the First World War.In A Peace to End All Peace, David Fromkin reveals how and why the Allies drew lines on an empty map that remade the geography and politics of the Middle East. 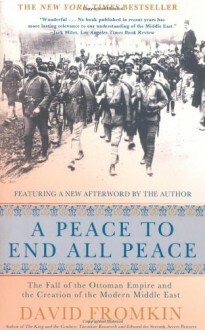 Focusing on the formative years of 1914 to 1922, when all seemed possible, he delivers in this sweeping and magisterial book the definitive account of this defining time, showing how the choices narrowed and the Middle East began along a road that led to the conflicts and confusion that continue to this day.A new afterword from Fromkin, written for this edition of the book, includes his invaluable, updated assessment of this region of the world today, and on what this history has to teach us.